and to add to that, weaning is a difficult process for some birds (especially cockatoos/macaws), some birds will one day decide they want to eat pellet and will do that completely on their own and want nothing to do with hand feeding any more, and as long as they keep their weight up, great (my senegal did that). however there are the birds who want to be hand fed for a long time, sometimes as long as a year and you need to hand feed them until the bird is ready to move on, i know cockatoos who are in their teens and just like the taste of formula so they get a bowl of it with their regular food, which is completely normal. there are also sometimes birds who are very stubborn and don't want to wean but give a hard time hand feeding as well. bottom line: let the bird wean on its own when THEY are ready, not when you don't feel like hand feeding anymore or when you "feel" that they should be done. obviously you want to try and gradually wean at an appropriate age, but if there are significant weight declines or the bird is not moving on to other foods, you need to keep hand feeding until the bird is ready to take the next step. no rushing. When my Mother bought her first Quaker it regressed and we ended up hand feeding her for at least a month while we re-weaned her. We had the option to give her back to the breeder, but we had already fallen in love with her and didn't want to give her up. We didn't lack any sort of bond wither her as she grew up. In fact, my bond with her was stronger than with any of the other birds. Then again she had already been weaned once and had technically left her parents. My case could be an exception. bmsweb wrote: I didn't think this was even a problem! I haven't come across any breeders who sell parrots that haven't been weaned yet (well not in Australia). When we were looking for Conures, the youngest one I came across was 8 weeks old and the breeder was planning on holding on to the bird for another week. I am living in Melbourne, and I have found heaps of Australian breeders similar to the one I'm about to tell you about! When buying my first parrot (blue quaker), I sadly brought it home at just 6 weeks of age. I had to had to handfeed the bird for a few days. The breeder was 100% happy with selling her birds at this young age. At the time I didn't know any better and I assumed all birds were sold at this young age. About a week after purchase, I took it to the vet. Turns out the bird was starving, it had been regurgitating all food, it had some parasites and an infection. The next day we returned the bird to the breeder, and got a full refund. Now, I have a new Quaker parrot who was bought from a very reliable breeder. He was sold to me at 12 weeks of age, DNA tested, with a whole package stuffed with information and a reference to a reliable avian vet. It is very apparent which breeder took more effort caring for their birds. And still to this day, I have no idea what happened to that sick quaker I bought. I assume it was re-sold to another unsuspecting person. IMO, the only benefit of hand feeding is to speed up the taming process. More often than not, without the bird being hand fed you are going to start with a more wild bird. As for negative effects of hand feeding... other than hand feeding done by unexperienced owners resulting in death, all of my birds have been hand fed and none of them have any feathering issues or poor behaviors related to being weaned by people. In the bird community in my state, I have not heard a single negative comment in regards to hand feeding. I am going to be breeding Vos eclectus' soon and I even considered letting the babes be parent raised, but was advised against it. And I agree, I don't want to be selling shy babies to new owners. Everyone deserves the chance to have a positive start! Types of Birds Owned: Pineapple green cheek conure, Goffin's cockatoo, bare-eyed cockatoo, Solomon Island's eclectus, 2 Vosmaeri eclectus, and a parrotlet. I have only read cursory information regarding breeding so I'm not an expert but it seems like you could still handle the parrot babies and allow them to continue to be fed and raised by the parents. Why would this be conflicting? Also in my opinion having a parent raised parrot seems like it would reduce the sexual frustration if they realize they are parrots and therefore won't mate-bond with people. I have to say having Nika bonded with me is a little problematic. No matter what I do she still gets all hormonal and excited by me sometimes, even just getting near her. She's more aggressive towards other people and can have a difficult time focusing when all she wants to do is make babies with me. Nika is an outlier I believe, in that she has re-learned how to fly moderately well after being clipped for years. However, it sounds like in general a chick raised by parrots not people will be able to fly better which sounds advantageous. the greater bond with handfed is a myth for breeder profit. i'm happy to see your birds don't have issues because of handfeeding. my cousin hand fed her , i thought the idea rediculous even before i read all the problems caused by handfeeding.i would say the bond with my older rescues is the same if not better than hers. while her bird is clipped and has no choice whether he wants to be with her or not mine are free to fly where they choose. breeders started this because of cost they sell birds earlier so they don't have to spend money caring for the babies instead they put that off on the people buying them. they also encourage more egg laying by removing the babies forcing the parents to replace them. i just saw a post on here where this person lost 2 babies handfeeing. Eurycerus wrote: I have to say having Nika bonded with me is a little problematic. No matter what I do she still gets all hormonal and excited by me sometimes, even just getting near her. She's more aggressive towards other people and can have a difficult time focusing when all she wants to do is make babies with me. It is VERY important not to encourage hormonal behavior such as mating dances and such. People like to watch, laugh, and show it to others but it only encourages the bird to try harder. When it doesn't work, the bird just bites instead. The best strategy I have found for dealing with it is food management, weight management, trick training, extensive exercise, avoiding nutritional surplus, avoiding hormonal triggers, keeping light/temperatures fairly constant, not touching places that trigger, not over petting, dropping any petting/touching the moment hormonal activity begins, taking away my attention when hormonal activity begins. Beyond that, extensive socialization, outings, exposures to mild jealous situations, and just dealing with things as they come. pennyandrocky wrote: the greater bond with handfed is a myth for breeder profit. i'm happy to see your birds don't have issues because of handfeeding. my cousin hand fed her , i thought the idea rediculous even before i read all the problems caused by handfeeding.i would say the bond with my older rescues is the same if not better than hers. while her bird is clipped and has no choice whether he wants to be with her or not mine are free to fly where they choose. breeders started this because of cost they sell birds earlier so they don't have to spend money caring for the babies instead they put that off on the people buying them. they also encourage more egg laying by removing the babies forcing the parents to replace them. i just saw a post on here where this person lost 2 babies handfeeing. 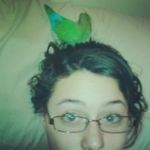 I am not a breeder, but my research and readings on parrot behavior confirm what pennyandrocky has written. from my research, as well as from my conversations with people who own parent raised birds, i have learned that parent raised birds end up being more emotionally stable, resilient, and less prone to neurotic behaviors like plucking, and less prone to aggression, biting, and less prone to screaming. the bird turns out to be healthier, and better adjusted, and just as sweet a pet. in the parent-raised school of thought, the breeder simply leaves the babies in the parents nest and aviary, and the baby eats, sleeps, and lives with its parents. parent raised birds may take a little bit more time to tame and train initially - hence their "shyness" - but it is worth it, as they do soon enough train beautifully and tend to have more balanced and calm personalities. there's an excellent parrot behavior specialist in the UK named Greg Glendell who has advocated parent-raising for years. hopefully more breeders will start to listen to him. the procedure of handfeeding disrupts various dimensions of a baby parrot's development, that are only now coming to light. a good majority of the parrots who are currently languishing in rescues today are handfed birds who have developed various behavioral problems. researchers in parrot behavior are starting to put together pieces of the puzzle, and they are discovering that parent raising a bird is good for the birds overall health and well being, and its behavior. this makes it more likely that the bird will be retained in its first home, and not surrendered to a rescue for behavioral problems. this has been a major breakthrough in parrot science. hopefully as more people listen to behaviorists like Greg Glendell, it will reduce the number of birds being surrendered to rescues. Ive had 6 parent reared, 1 handfed at weaning due to abandonment and 1 handfed. By far the most balanced birds I've had were the parent reared once they had tamed down which didn't take long at all. The bond was just as strong as what I've had with the 2 handfed, the only exception to that was Harlie who was abused, the other parent reared all came to me at various ages, the youngest was at a guess 8 months old based on his leg band and the oldest was about 12-14 years old. Whilst I haven't had any major behavioural problems per see I would go with the parent reared every time if I were to seek out a non-rescue (which isn't going to happen now but still...) at the very least I would go for a co-parented chick but never a hand reared again. There is absolutely no way I would bring home an unweaned baby unless it was life or death like with Tico the one who was abandoned (she wasn't from a breeder), theres no excuse for breeders to be selling unweaned chicks. I think it has less to do with the feeding and more to do with the handling. Trouble is that most breeders who sell parent raised birds don't handle them. Since the parents are doing all the work, they don't bother. It's like by default in order to "hand feed" they are required to "handle" the birds so you at least get that much out of them. In the long span of things, taming/training plays a far greater role than how the bird was fed. However, having one that was handled since a baby does set things up pretty well for the future. friend2parrots wrote: hopefully as more people listen to behaviorists like Greg Glendell, it will reduce the number of birds being surrendered to rescues. I don't think this is true at all. How owners handle their birds for decades plays a far more substantial role than who fed the bird when it was a baby. Possibly a couple less birds would be surrendered because of plucking/screaming learned as a baby yet just as many or more will be surrendered for not being cuddly or easy to handle. Ultimately it comes down to what owners do with their parrots. This is where education is essential. The biggest problem is that most people don't care enough to learn what to do and just get rid of the birds instead.